At Barry Bonds' Trial, Prosecution And Defense Close Their Cases : The Two-Way "All he had to do was tell the truth" about performance-enhancing drugs, the prosecutor says. But Bonds' lawyer argues the government didn't prove its case and was out to get his client. 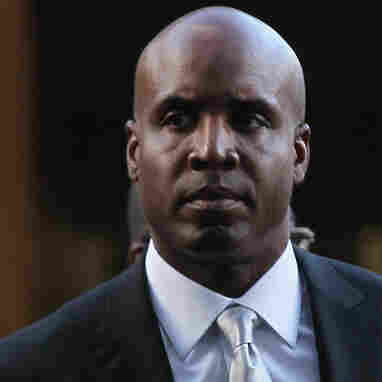 "All he had to do was tell the truth," Assistant U.S. Attorney Jeff Nedrow told a San Francisco jury earlier today as the prosecution summed up its case against former baseball great Barry Bonds, who is accused of lying to a grand jury about whether he knew used performance-enhancing drugs.
" 'He rambles,' Ruby said. 'But last time I checked, that isn't a crime.' "
NPR's Richard Gonzales, who has been covering the case, will be on All Things Considered later to talk about it. We'll add his report to this post when it's ready. Richard told NPR's Newscast desk earlier that the crux of the prosecution's case is that "it's implausible" for Bonds to argue that he didn't know he had been injected with steroids by a trainer. "The government is alleging that he knew he was getting steroids and that he lied about it ... to salvage his career," Richard added.